Take down the Welcome Aliens! bunting and pack away the cosmic red carpet. New observations have suggestedthat the alien megastructure spotted around a distant star is probably not alien at all, and likely has a more mundane (but probably still interesting) natural explanation. Here come the pretzels. The star system KIC 8462852, 1,400 light-years away,hit the news big time when Jason Wright, an astrophysicist from Pennsylvania State University, suggested to The Atlantic that a huge dip in light seen from the star up to 20 percentof its light could be artificial in origin. Naturally, this had people dreaming of Dyson spheres, vast theoretical structures that could potentially harness the power of entire stars, and other exciting extraterrestrial constructs. 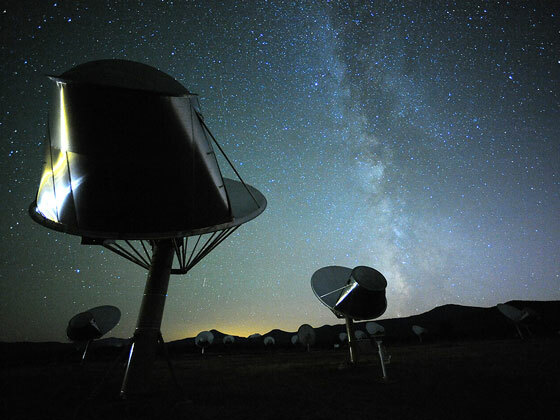 But following the suggestion, the SETI (Search for Extraterrestrial Intelligence) Institute in Mountain View, California,trained their vast Allen Telescope Array of 42 antennas on the system. And now, after two weeks of observations, the results are in and its disappointing news. The array looked for signals between frequencies of one and 10 gigahertz, which would be consistent with emissions from an alien race harnessing the power of an entire star, and found nothing. They also looked for a hailing signal being sent out in all directions, but to no avail. This rules out omnidirectional transmitters of approximately 100 times todays total terrestrial energy usage in the case of the narrow-band signals, and ten million times that usage for broadband emissions, astatementfrom SETI said. The history of astronomy tells us that every time we thought we had found a phenomenon due to the activities of extraterrestrials, we were wrong, SETI Institute director Seth Shostak said in the statement. But although its quite likely that this stars strange behavior is due to nature, not aliens, its only prudent to check such things out. However, the lack of a detection in the microwave frequency band that was studied, which Shostak thinks would be “favored for interstellar signalling,” suggests the object is more likely a natural than an artificial phenomenon.The most prominent theory, suggested in a paper led by Tabetha Boyajian in September, is that it is a cloud of debris, possibly cometary in origin. While the alien theory can seemingly be ruled out, dont despair just yet.With hundreds of billions of planets in our galaxy alone, its pretty unlikely that ours is the only one that hosts life. Even in our own Solar System, there are hints that worlds such as Mars and Saturn’s moonEnceladus may be habitable, and were doing our best to find out if theres anything out there via various current and future spacecraft. The dream may appear to be over forKIC8462852, but the search for other life in the universe goes on.